Please view the collection of ab wheels currently available at MAD-HQ produced by leading fitness brand Fitness-Mad! 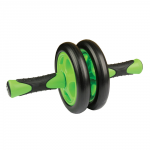 The Ab Wheel is the perfect abdominal training tool or accessory to work your core and strengthen muscles. The wheeled design allows you to use the tool with both arms, or by single arm use. For all other accessories used in Fitness training workouts, head over to the Fitness Accessories section or alternatively visit the Fitness-Mad home page, home to all products produced by Fitness-Mad.